The 7P Ranch is owned by Joe Prud’homme and family. The 7P name is derived from the Prud’homme family which consists of Joe, his late wife Mary and their five offspring Carol, Sharon, Joseph II, Steven and Sheila. Joe’s roots in the cattle business extend to 1951 as a 14 year old calf roper in Pineland, Texas. He purchased 30 registered gray Brahman heifers for an FFA project in his sophomore year of high school. He halter broke this group and then purchased his first bull which was a Manso son from J.D. Hudgins. He later cross bred those Brahmans to an Angus bull. Joe was forced to sell his herd in the late 1960’s while he was in med school, but was determined to have a herd again. Joe bought back in to the cattle business in 1972 when he moved to Tyler, Texas. He purchased the first 550 acres in Winona, Texas that would make up the current 7P Ranch. Joe bought a herd of Simmental cows and began an exclusive artificial insemination program. The first 7P Ranch sale was in 1975 and consisted of percentage Simmental and Simbrah. Full blood genetics were initially used in the breeding program in order to progress to the highest Simmental percentage. The full blood herd was purchase from leading breeders and included a select group of proven donor cattle from Georges Creek. These donors were flushed mainly to moderate framed full Fleckvieh A.I. sires (i.e. Metro, Knight Stinger, Klondike Arnie and Regent) exclusively until the early 1990’s. Only A.I. and embryo transfer were utilized in the breeding process up to this time. Then, the 7P Ranch began breeding the Fleckvieh Simmentals to red non-dilutor purebred bulls like Mackfrid, Big Sky and Red Light. The red purebred heifers were then bred to the best black purebred sires such as Black Irish Kansas, Black Mick and 600U. Top Angus genetics were infused using A.I. 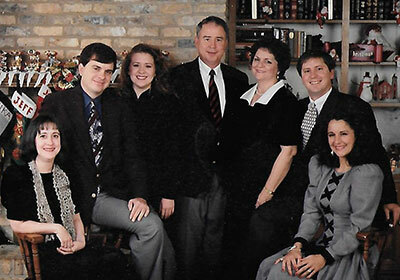 to a portion of the herd in 2005. The purpose was to meet the demand of the commercial breeders for a SimAngus product. This has proved to be a very successful cross. A spring bull sale was added in 1980. A few years later a commercial female sale was initiated in conjunction with this bull sale. In the beginning, Brangus and Braford calves were purchased, A.I.d and sold as bred heifers. In recent years, the ranch has only sold Braford F-1 females produced from the gray Brahman herd and horned Hereford herd bulls. The commercial females are now sold in the Annual Production Sale in October. Joe has always said that the head of family was his wife Mary. She was the foundation the entire family stood upon. Before her passing in 2009, she was at his side in the dreaming, the planning and the implementing of the 7P Ranch operation. She knew better than anyone that ranching effectively would keep our standard of living low, but we were building something of great value together. This value did not end with developing a tract of land or a herd that was second to none. Relationships were developed with people all over Texas and the United States. Joe and Mary discovered together, the people that would be considered their dearest friends. Tom Barker is the manager of 7P Ranch.He resides on the ranch with his son, Thomas. Tom is originally from Lockport, Louisiana and is an Agribusiness graduate from Nicholls State University. 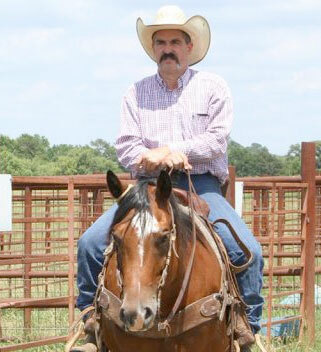 Tom became a member of the 7P Ranch family in 2009.